"Shoe culture is a beast," storyteller Cara Brigandi said at The Paper Machete — and she wasn&apos;t just talking about women who buy Jimmy Choo&apos;s worth several hundred dollars. She was talking about the importance of stylish sneakers among black youths. But sometimes fashion goes too far: Forbes reported this past weekend that the controversial, now-unavailable JM Roundhouse Mids sneaker was causing the Olympic committee to reconsider Adidas as a sponsor. Adidas got all sorts of excited about their new shoe that was to debut in August. I did too, I was excited. I love me some Adidas. They’re stylie, look amazing with a pair of skinny jeans and they bring me back to the old school. The White Shell Toes? That was my s***! And though marketing and hip-hop and some pretty talented designers they have created quite a name for themselves. So they took to Facebook to show off this new gem. 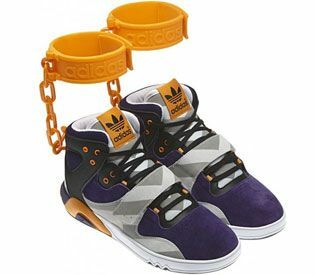 And there they were: They had a purple suede toe, black laces, orange shackles, kind of high top-ish with black pip— SHACKLES?! Before they were released they were recalled. Shackles. Like the shackles Africans were beaten into and then forced onto ships, heading to the land of the free and the home of the brave. Like the shackles placed on prisoners.